Caletensium et Bononiensium Ditionis Accurata Delinatio. / Veromanduorum Eorumque Confinium Exactissima Discriptio. Two rare regional Abraham Ortelius maps on a single folio sheet. Left map, entitled Caletensium,depicts the French and Belgian coastline from Estables to Calais. Cartographically based upon a four sheet map issued by Nicholas de Nicolay. The right map, entitled Veromandorum, depicts the immediate vicinity of Saint-Quentin in northern France. This map is based upon the cartographic work of Jean de Surhon who was commissioned by the crown to map the region in 1557. Each map features a decorative title cartouche in the lower left quadrant. Both maps show their respective regions in wonderful detail with attention to forest cities, roads, rivers and villages. 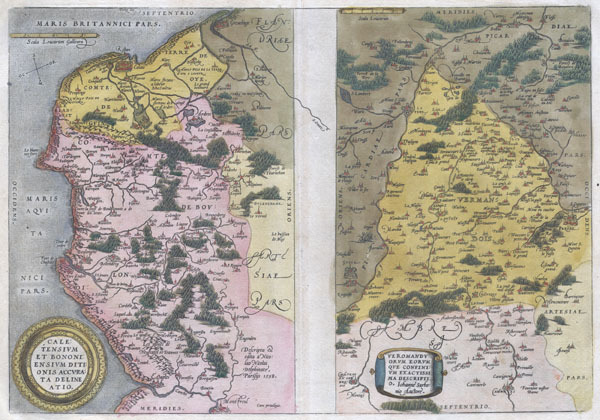 Published in Antwerp by A. Ortelius in 1579 for issue in his seminal atlas Theatrum Orbis Terrarum. Very good condition. Original centerfold. Latin text on verso. Van den Broecke, marcel P.R., Ortelius Atlas Maps: An Illustrated Guide, 45. Koeman, Cornelis, Atlantes Neerlandici. Bibliography of Terrestrial, Maritime and Celestial Atlases and Pilot Books, Published in the Netherlands up to 1880, vol III, Ortelius 21.